YIP is partner in the Save Our Soils Campaign! Just like previous years, YIP is partnering with Nature & More from the Netherlands for the Initiative Forum 2013. Each year we give them something in return for their generous sponsoring with Organic Fruit & Vegetables. Last year we helped with the Bees Love Organic campaign, and this year we will be focussing on Saving Our Soils. ‘If we don’t protect the basis of our food production and our ecosystems – which is soil – we will have a big problem in the future‘ says Alexander Müller, Assistant Director-General of the FAO. Publications from the United Nations and the European Commission indicate that every minute the equivalent of 30 soccer fields of fertile soil is being destroyed, mostly due to irresponsible farming techniques. As a result, we are losing 10 million ha of farmland every year. Today ¼ of the earth’s soils are highly degraded, according to scientists. 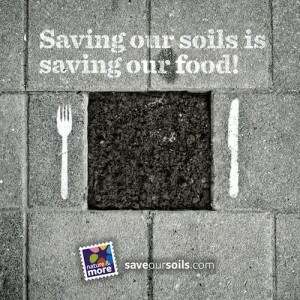 The Save Our Soils Campaign will run from December 2012 until December of 2017, the International Year of Soils. Nature & More (www.natureandmore.com) is an international ‘trace & tell’ scheme for organic food. It uses an integral sustainability model, the “sustainability flower”, to monitor, manage and communicate sustainable achievements of organic farmers. The sustainability flower was developed in 2009 by an international think tank of organic pioneers and business leaders.